Since the Camp Fire in Butte County blew up a week ago, the Bay Area has been choked with smoke, fouling the air quality throughout the region. As of Thursday afternoon, air quality readings had gotten so bad in San Francisco that it reached "hazardous" levels per EPA standards. Due to the smoke, a number of Bay Area school districts have canceled classes on Friday. Conditions are expected to remain smoky at least through the weekend, stretching the current stint of bad air to nearly two weeks, and leaving many residents wondering how to cope. Sharon Chinthrajah, a clinical associate professor in allergy and immunology at Stanford, and Kirk Smith, a professor of global environmental health at UC Berkeley, appeared on KQED's Forum program Wednesday to answer questions about smoke, air quality and the resulting health effects from exposure to toxic particles. What Exactly is in the Air? When wildfires burn, they release a range of particles into the air. Wood smoke also contains chemicals like formaldehyde and benzene, especially when fire sweeps through urban areas. Most of the ash consists of visible particles, but "really it's the small particles we worry about," said Chinthrajah. In "particular," she means particles less than 2.5 microns in diameter. (A micron is 1/1,000,000th of a meter, or .00004 inches. For comparison, a human red blood cell is about five microns across.) When you breathe in particles smaller than 2.5 microns in diameter, they can readily enter your lungs and bloodstream. While there are a number of studies that have tracked the long-term effects of breathing in chronic air pollution, said Smith, it's more difficult to pin down the short-term effects. In the long-term, chronic exposure to small particles has been linked to early morbidity, decreased lung function, and compromised immune cells. One study suggested that 6.5 million people die each year prematurely due to poor air quality. In the short-term, however, it's difficult to pin down what the effects are to those who aren't already vulnerable to existing heart or lung disease. There are a number of sites that track air quality, such as AirNow.gov, which uses sensors and data from the Bay Area Air Quality Management District, and the privately run PurpleAir, and uses crowd-sourced data from its own network of for-sale air quality sensors. Many of them have been overrun with web traffic, however. You can also use the KQED air quality map, which is updated continually with AirNow data. All of these sites allow you to type in your zip code and see the AQI, or Air Quality Index number, with a description of what that number means. The AQI is a standard calculation that quantifies both ozone pollution and PM 2.5, or particles 2.5 microns wide. AQI numbers over 100 are considered unhealthy for sensitive groups, over 150 is considered unhealthy even for healthy people, and over 200 is considered hazardous. While we are currently experiencing values in the high-100s and low-200s, other parts of the world regularly have AQI numbers higher than that. New Delhi, where Smith lives half of the year, had a 340 AQI when he looked it up before coming on the program. 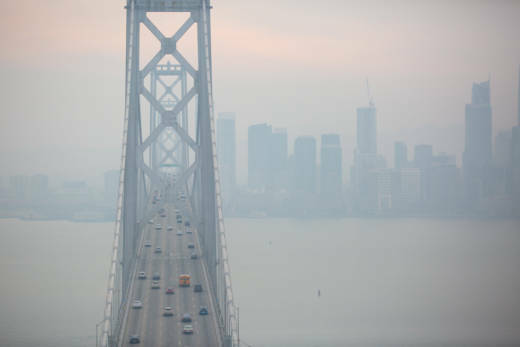 It's a "global phenomenon," he said, adding for perspective that the worst air-quality days in the Bay Area are probably comparable to the best days in New Delhi. Limit your outdoor exposure. Even in a drafty house, the amount of air pollution is less than outdoors, because particles are absorbed partially by walls and don't penetrate fully. Indoor air in the average house in the U.S., said Smith, is typically 15 percent less polluted than outside. However, if you have HEPA-certified air filters running, doors and windows closed, gaps sealed, and the air recirculating inside the house, then you can bring the air pollution levels down to 3-4 times lower than outside, Smith noted. Most air conditioners, heaters and air circulation units bring air in from the outdoors. You want to turn off that function and let the system recirculate indoor air. Don't go in and out of the house frequently, so as not to bring in outside air, and don't burn things inside the house, like candles or incense. Unfortunately there hasn't been a consistent government standard for testing air filters, but you want to have a filter rated to at least PM 2.5 and from a reputable company. Additionally, said Smith, you'll want to consider the CADR (clean air delivery rate) of your air filter; a small filter in the corner won't deliver enough cubic feet of clean air to fill a large room. And you need to replace the filters in the units regularly, both in your furnace, portable air filters and in your car. If you have to be outside, then a mask rated at least N95 can catch many of the particles, if it fits well, said Chinthrajah. Health professionals will even get their masks fitted to make sure there is a good seal that doesn't let air in. However, over-the-counter masks can fit badly, particularly for small kids or adults with facial hair. "Unless it's very uncomfortable, it's not working," said Smith. Masks also don't last forever. Particles get trapped in them over time and the masks have to be replaced. Although it depends on the pollution levels, Smith suggested replacing them every few days or over a week at most, in conditions like this.